The first Wayfarer was designed by Ian Proctor in the 1950s and was largely inspired by a story his wife had told him about her girlhood when she and friends explored local waterways in dinghies in which they camped with the sails thrown over the boom for shelter. The design aimed to produce a boat, which, unlike the heavy clinker built boats in which his wife camped, could give a good performance when raced, but also be stable and roomy enough in which to cruise. Many exciting cruises have been taken in Wayfarers but its reputation was copperfastened by Frank Dye who sailed his boat from Scotland to Norway, then later from Scotland to Iceland. Despite being capsized several times, and breaking his mast in two places, Dye and his crew safely reached Reykavick. 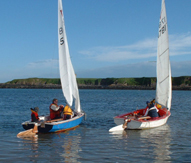 Wayfarers have been sailed at Skerries Sailing Club for several years but the class has grown dramatically in the recent past. Over the last six years, the Wayfarer fleet has grown from three boats to a current standing of more than a dozen. 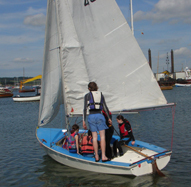 The class is involved in various events including regular club racing, cruises, barbeques, training courses etc. The Wayfarer has been a favorite route into the club for beginners and new members. A friendly, welcoming atmosphere is guaranteed to greet first-timers and novices to the class or the sport generally. Training, lectures, and coaching are organised throughout the season which is aimed both at beginners trying to grasp the basics and more accomplished sailors who wish to fine tune existing skills. photo on the right. This makes it ideal for novices. It is also terrific fun to race. It has a relatively simple rig set up and no trapeze which makes for great tactical racing. In many of the club races last year, the first four boats were over the line within 20 seconds of one another after almost an hour of racing! Several Skerries boats sometimes travel to events at other clubs or to championship events abroad. In 2006 four Irish boats represented their country and the Wayfarer Europeans in Holland. This year, 2008, it is Skerries’ turn to host this event. There are also a number of intermediate and more experienced sailors within the class who are always willing to share their skills. Training weekends and lectures are regularly organised on topics such as tuning, racing rules, boat-handling and sailing technique. Contact the Wayfarer Class Captain for more information. The class also plans a number of day cruises during the coming season. Traditionally this involves a sail to Loughshinny (see pic above left) for a beach barbecue with firiends and family followed by a pleasant sail back to Skerries. Other venues can include Rush, Rockabill, one of the Skerries islands, Balbriggan or Laytown. If you would like to try dinghy sailing for the first time or if you are an experienced sailor who wants to join a growing competitive fleet, please send an email to the Class Captain. Someone will contact you to arrange an introductory sail at the club (which of course will be free).